This study addresses the issue of the construction of cartographies aimed at an architectural design of the territory. 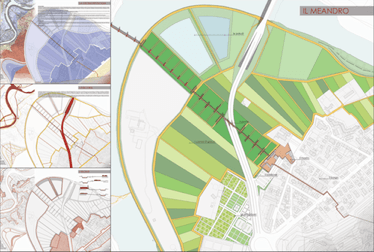 Its objective is to produce maps that may adequately define participatory design rules in the territorial scale and attempt to render the problematic multiplicity and the variety of individuals involved today in the processes of physical transformation of territory. The proposal intends to study archeological cartography techniques with the purpose to build participatory support whereby different actors can be made to interact not only on ideological and programmatic issues, but above all on the ground of the physical and architectural results of their own territorial mapping.